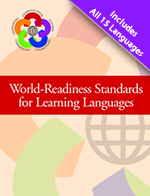 Search for ACTFL products by type, author, and/or description below. Can't find what you're looking for, or wish to put in a large order (ie. over 50 lbs.) for your school or district? Contact us at membership@actfl.org or (703) 894-2900.